Love of Fiber, Crafts, Writing, Music, Knowledge, Discovery, and continious evolution. It's a mystery - 2013! 2012 is done, and it really turned out to be one of the lowest years of craft productin for me. I started out 2012 with alot of momentum; starting and finishing projects, and then hit a slump. The sudden halt to my crafting, whether it be knitting, crocheting, sewing, you name it, simply was a result of my personal life getting in the way. After all the craziness with changes last year, finally things are starting to gain perspective and I'm getting back into my groove with all my interests, which includes blogging. I don't monitor my blog followers and don't know who, if any, read my posts, but if you do, thank you for your support! Now, I know 13 is known to be a superstitious number, but I think, for me, it'll be a good. So, I'm starting off 2013 with a fresh project, and it's aptly named, "It's a mystery". This is the annual sock mystery kal hosted by Kirsten Kapur from Through the Loops. We received the 1st clue today, and I cast on and finished the 1st clue. Each clue to be released weekly, so I'll have time to give attention to other projects while waiting for the 2nd clue's release. I love knitting mystery kals', its always nice to see the pattern progress and not know what the end result is. I went with Marmalade from Scout's Swag, a beautiful speckled yellow I picked up years ago in a dye class Scout held at Knit One Knit Two in Berkeley. The first clue is only the cuff portion, and started off with a picot edging, which immediately made me happy with my yarn choice. 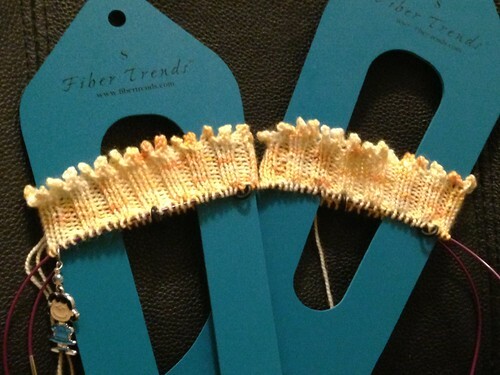 I think the speckled yellow is very fitting for the fun and flirty picot edging. Now I'm really excited for the next clue! Aside from this new project, I'm now actively searching my stash for a lace yarn to start another knit mystery hosted by Susanna IC. This one is a shawl with beads! 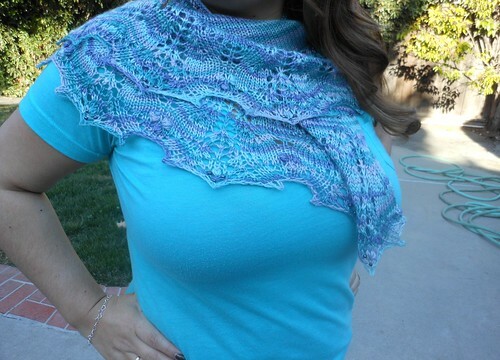 This will be my 2nd time doing a Susanna IC mystery kal. For now those are what's going to be hitting my needles, but I have more to start, I'll share as those come to fruition. I'll be posting again, to share clue 2 of TTL Sock Mystery and clue 1 of Susanna IC Mystery too! 2013 will be a blogging year! Finished my SusannaIC January Mystery shawl! While the colors weren't my FIRST choice, I'm actually loving it! Even more thankful I had a top to wear with it to properly show off the colors. This week for whatever reasons has seemed to be one L - O - N - G drawn out week. Not alot of knitting progress made this week, sadly, just a whirlwind of life's little presents. Although, there have a been a few highlights to look forward too, received some new squishy lovelies to play with. 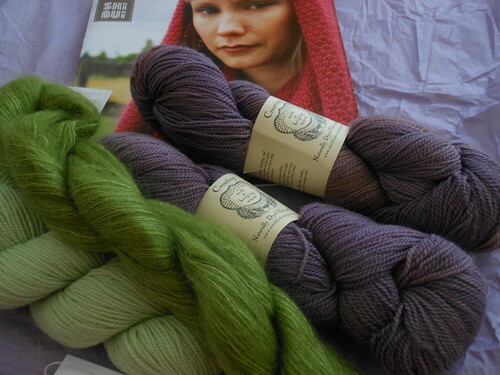 The two green skeins, from corner left are Shibui yarn in Staccato, and Silk Cloud. 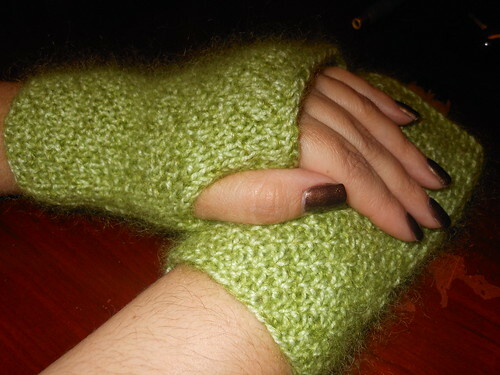 These lovely skeins are were destined to be a pair of fingerless gloves; sample knit for the Knitting Ranch. 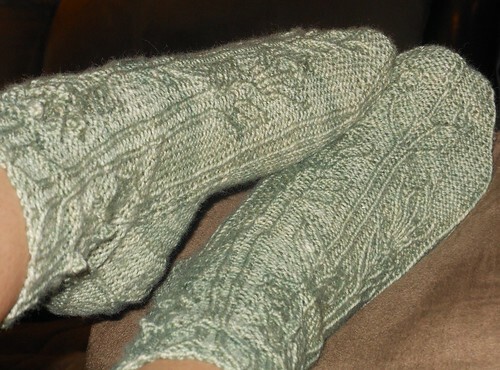 I offered to knit these for Suzi, who also hosts a wonderful virutal kal! Yes! That means I get to sit and knit from home and connect virtually with my other knitterly friends. I part taked in my first session last Saturday morning. The current virtual kal is for the Lacy Prairie shawl, for which the two other purple skeins in the picture above are destined for. The skeins are A Verb for Keeping Warm in Hyacynth. 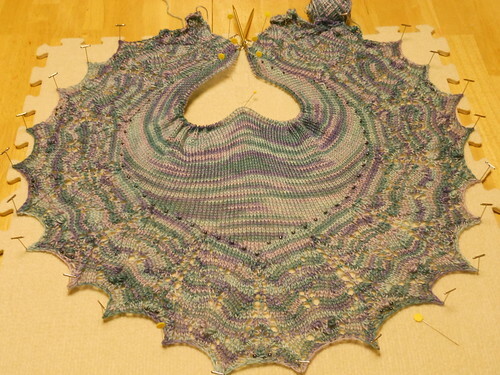 I'll share my progress on the shawl once I get to take some pictures. 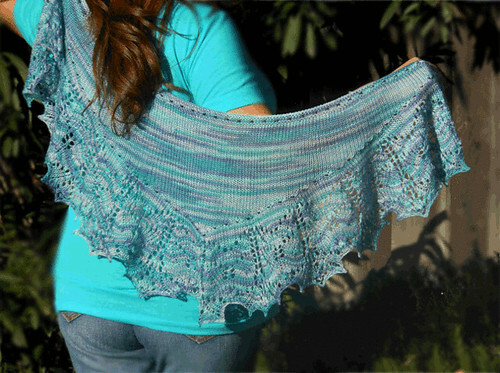 A special thank you to my dearest friend Marisol for sharing this virtual kal. 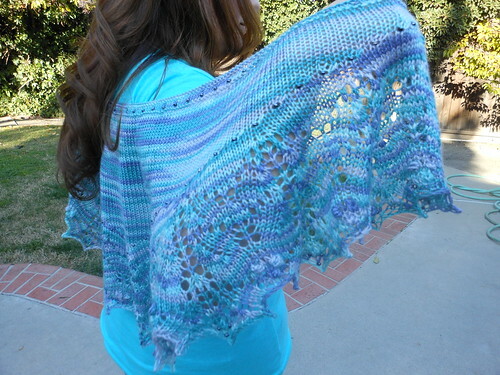 For now I'll leave you with a very soon to be FO of the SusannaIC Mystery Shawl. Almost done with this shawl, one clue left for this weekend. Copyright © 2010, [Rockinknit]. All rights reserved.